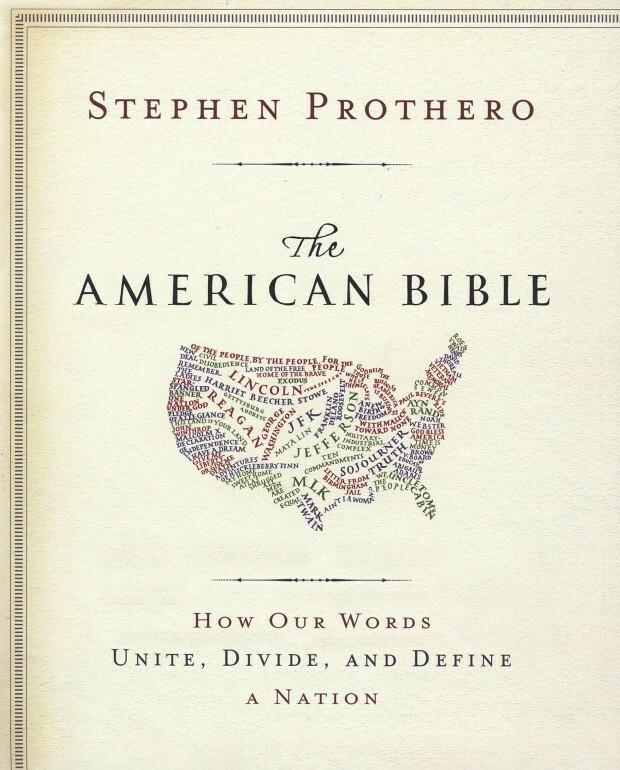 “The American Bible: How Our Words Unite, Divide and Define a Nation” by Stephen Prothero. HarperCollins (San Francisco, 2012). 531 pp., $29.99. Stephen Prothero, a professor of religion at Boston University, has compiled diverse texts and genres — song lyrics, letters, legal documents, essays, proverbs and fiction — into an American bible, a canon to illustrate our short but contentious history. Prothero’s bible is an abbreviated version of the Christian one: Genesis, Law, Chronicles, Psalms, Proverbs, Prophets, Lamentations, Gospels, Acts and Epistles. The documents he has chosen cluster logically in these books: early documents in Genesis, fiction in Chronicles, song lyrics in Psalms and letters in Epistles. Within each book he mixes documents from different times and different authors. Law, for example, includes the Constitution (1787) and two Supreme Court decisions: Brown v. Board of Education (1954) and Roe v. Wade (1973). Psalms includes the lyrics of “The Star Spangled Banner” (1814); “God Bless America” (1938) and “This Land is Your Land” (1940.) Proverbs, the most diverse section, ranges from Chief Joseph’s “I will fight no more forever” (1877) to Calvin Coolidge’s 1925 declaration that “The business of America is business” and Ronald Reagan’s “evil empire” in 1983. Prothero introduces each text with a concise explanation of its author, context and influence on our national conversation. We are able to read the original document (in full or as illustrative excerpts) and so gain a better sense of how honestly and accurately it has been interpreted. Finally, there are pages of commentary that illustrate how the text has been used — or misused. The melding of text and commentary is the book’s most distinctive focus: it shows, rather than tells us, what the American conversation has been. But it is also the area where we have to trust the editor — who, like all of us, has his own political and religious biases, whether they are made explicit or not. This is not a reason not to read this valuable book, but simply to be aware that this is an edited book. The range of authors is remarkable; any book that includes Sen. John Kerry, Rep. Henry Hyde, Wendell Wilkie, William Faulkner, W.E.B. DuBois, Sarah Palin and Daniel Webster (to name just a few participants in this national conversation) deserves to be called catholic, in the sense of universal. It is surprising, though, to find so few Catholic voices (why Father Charles Coughlin and Mary Daly and not Cardinal Joseph Bernardin and Dorothy Day?) It is a particularly disappointing omission because the church has given deep thought to the common good, which is really Prothero’s subtext. “The American Bible” can help restore that chain of memory. It isn’t a perfect book, but it’s good enough for a less than perfect experiment in democracy. Linner, a freelance writer and reviewer, has a master’s in theological studies from Weston Jesuit School of Theology.